The titular juxtaposition of Cowboys & Aliens portends an unfortunate stylistic clash first born at the crowded writers table. As the last of a revolving door of contributors throughout the film’s gestation, “Lost” creator Damon Lindelof’s penchant for character development over narrative symmetry proves a toxic mix with Transformers/Star Trek scribes Roberto Orci and Alex Kurtzman’s outlook that characters are mere window dressing for visual razzle-dazzle. The dissatisfying result is a rather passé alien invasion flick populated by Old West archetypes that you end up knowing/caring less about the longer you’re around them. Director Jon Favreau (Iron Man and Iron Man 2, spanning the spectrum) uses the opening half-hour to establish an engaging Western tableau. Amnesic Man With No Memory (Daniel Craig) awakens in the 1873 Arizona desert with a stab wound in his side and a laser gun mysteriously strapped to his wrist. He wanders into a town named Absolution, where the real power broker is gruff cattle baron and ex-Army colonel Woodrow Dolarhyde (gruff Harrison Ford). Their mounting conflict, along with any plot intrigue, evaporates as soon as the alien abductions begin. 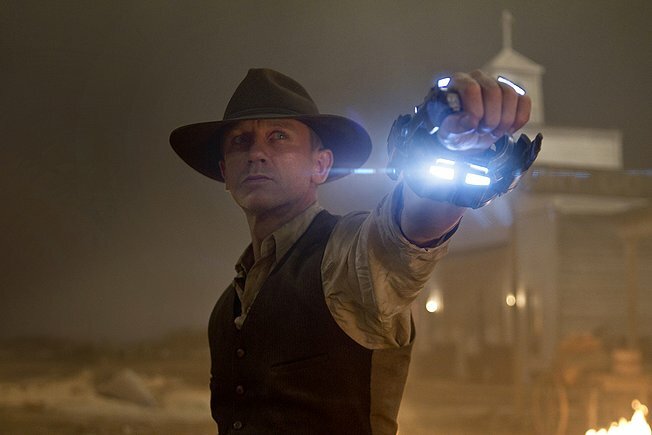 From there, Cowboys & Aliens is a meandering rescue mission punctuated by the back-story of a doe-eyed mystery woman (Olivia Wilde) and action sequences that pause frequently mid-battle for cloying moments of redemption – e.g., Dolarhyde eventually grows to regard Injuns, including his noble ward (Adam Beach), as real people, too. As the film lumbers along, it becomes alarmingly apparent that the story the audience is writing in its collective head is far more interesting and original than the one that ends up onscreen. Favreau gets trapped between embracing the story’s dark elements and preserving a popcorn-munching crowd-pleaser. He accomplishes neither, demonstrating he knows the paces of each genre but can’t find their rhyme. Even by the time it rides off into the sunset, Cowboys & Aliens still remains a title in search of a movie.